MPDCCH carries common and UE-specific signalling. Several different IEs in RRC message configures the number of MPDCCH repetition depending on the application of the MPDCCH as listed below. Multiple MPDCCHs are supported and a UE monitors a set of MPDCCHs. MPDCCHs are formed by aggregation of enhanced control channel elements(eCCE), each eCCE consisting of a set of resource elements. Different code rates for MPDCCHs are realized by aggregating different numbers of eCCE. MPDCCH supports RA-RNTI, SI-RNTI, P-RNTI, C-RNTI, Temporary C-RNTI and SPS C-RNTI. 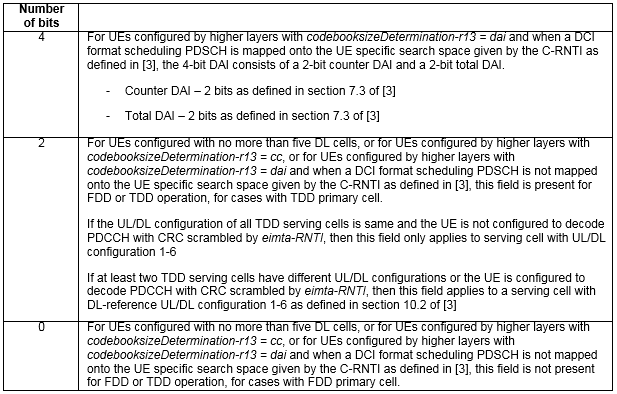 As there are multiple different PDCCH format in legacy LTE, there are several different EPDCCH/MPDCCH formats for LTE-M1. Depending on a couple of factors, one of two different sets of EPDCCH/MPDCCH formats are used. Number of ECCEs for each EPDCCH/MPDCCH are slightly different between the two sets. Case 1 : MPDCCH associated with 2 or 4 PRBs, No Repetition. We use special DCI formats for BL Operations. At high level operation, the function of these new DCIs are similar to DCIs for legacy LTE. There is slight differences in terms of details. This is to schedule PUSCH (i.e, UL Grant). It has the same role as DCI Format 0 in legacy LTE. The number of bits for MSB part of Uplink Resource Block assignment is determined by following table. As shown here, the bit length varies depending on system bandwidth. Actually this bit length is the one that is required to represents all the narrowband index for each system bandwidth. The number of bits for MSB part of Downlink Resource Block assignment is determined by following table. As shown here, the bit length varies depending on system bandwidth. Actually this bit length is the one that is required to represents all the narrowband index for each system bandwidth.